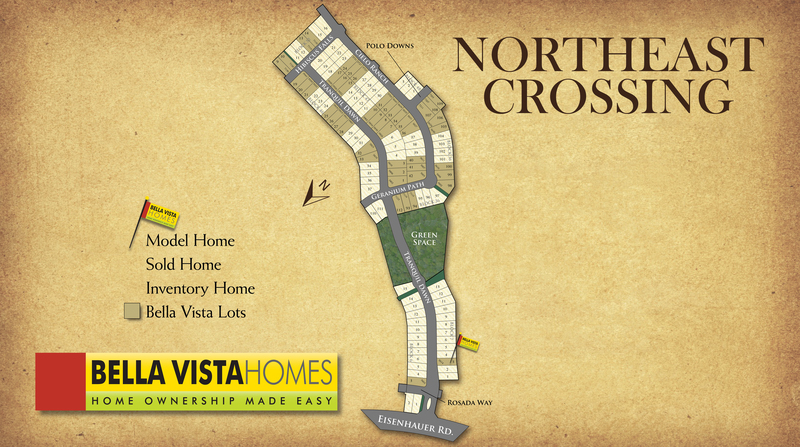 Bella Vista Homes would like you to come by and visit the charming community of Northeast Crossing located just minutes from Fort Sam Houston, Brooke Army Medical Center (BAMC), Randolph Air Force Base, Rackspace, San Antonio International Airport. The map below should give you a better perspective on Northeast Crossing's location. Northeast Crossing offers convenient access to IH-35, IH-10, and Loop 410. Students who live in Northeast Crossing may attend schools in either Northeast I.S.D. or Judson I.S.D. dependent on the school district boundary. Please visit our community and see what works best for you and your family. In this brand new floorplan expect to see an open layout with a study option added downstairs and a gameroom upstairs. The master suite is located downstairs and has a beautiful bay window perfect for a sitting area. Vinyl wood plank flooring can be found in all the wet areas, family room, and study. In the grand kitchen expect to see upgraded black appliance, granite countertops with upgraded backsplash. There are 10' vaulted ceilings throughout the home. This home is complete with a covered back patio, water softener pre-plumbing, and zone damper system. This floorplan features an open layout and gameroom with the 4th bedroom option. The living area is open to the second floor where the gameroom overlooks the family room. The grand kitchen is open to the family room and includes granite countertops, upgraded 42" flat panel cabinets, and stainless steel appliances. Expect to see tile throughout the first floor. Enjoy the outdoors with the covered patio. In this brand new floorplan expect to see an open layout with a study downstairs and a gameroom upstairs. The master suite is located downstairs and has a beautiful bay window perfect for a sitting area and a large walk-in shower with tile surround. Tile flooring can be found in all the wet areas, family room and study. In the grand kitchen expect to see stainless steel appliances, granite countertops with tile backsplash. This home is complete with a covered back patio.